My wife and I tried the Mango Pineapple Pie as a part of the "Ebi Feast" meal. The "feast" included the Wasabi Ebi Burger, together with this pie, and the promo McFizz (which I've yet to review). McDonald's Singapore always has the most generous pricing, so buying this large, 3 item-combo allowed you to save an whopping 5 cents (4 US Cents) over buying them separately! This pie was launched a couple weeks before with the standard Ebi Burger, but I never got around to trying it, so this was the perfect opportunity to finally give it a try. 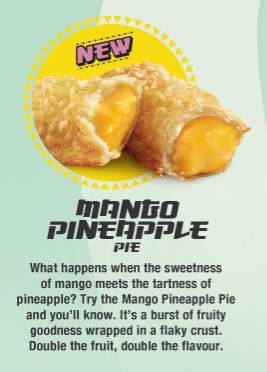 The although I knew it was going to be a fried pie, the thought of a Mango-anything-pie was enticing enough for me. The pie was the standard fried pie that you get in Asia. I didn't really know what to expect going in, as I wasn't sure which combination of the two fruits was going to be more prevalent. I have had Pineapple Pies a number of times (and Singapore seems to bring it back yearly with the Prosperity Burger). Although I've had a couple mango flavoured items, I missed the Baked Peach Pie when I was in Canada a couple winters ago when it was sold as a promo item, as it was completely sold out wherever I looked. That looks like real pineapple to me! I know I say this every time I do a fried pie review, but I would have preferred it to have been baked, as I'm simply not a fan of the fried shell. The fruit filling was a much better than I was expecting, as it was primarily mango purée surrounding pieces of actual pineapple chunks. It was much better than the pineapple pies I've had before, but what would have made it even nicer if there were a couple soft pieces of mango in there, since if your bite had a piece of pineapple, it overpowered the mango. Since the actual pineapple pieces were surrounded by mango purée, it didn't have that artificial syrup fruit flavour you might have expected it to have, it ended up being one of the better fruit pies I've had in recent memory.